What is Snoozer Orthopedic Cozy Cave Pet Bed? The Snoozer Orthopedic Cozy Cave Pet Bed is a great cozy bed for all pets, but especially for older pets. It is made with a thick fabric hood that creates a cave-like environment, and 3" orthopedic foam, which is great for sore joints. It has a warm and cozy sherpa lining, which creates a 2" layer for added comfort. The Snoozer Orthopedic Cozy Cave Pet Bed is also great for cats that love to nestle and hide. The Snoozer Cozy Cave Pet Bed is available in small, large and Xlarge sizes, and three color options. Snoozer Orthopedic Cozy Cave Pet Bed creates a cave-like aspect for pets to burrow down into. The interior is made with 2" sherpa fabric to keep pets nice and cozy, and a 3" thick orthopedic foam that is great for all pets, but especially older pets that have joint troubles. The Snoozer Orthopedic Cozy Cave Pet Bed is great for all pets all year-round, especially during the winter months. It comes in 3 different sizes, so measure your pet to determine which size you need. 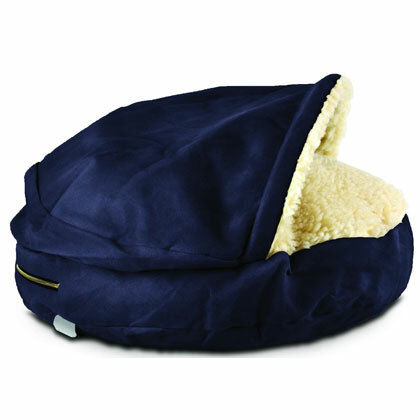 Snoozer Orthopedic Cozy Cave Pet Bed keeps your pet nice and cozy during chilly days, or anytime year-round. Pets love to burrow themselves in the soft 2" sherpa fabric. 3" orthopedic foam makes it great for senior pets that have sore joints. Dachshunds and terriers, and cats, especially love the feeling of security inside the Snoozer Orthopedic Cozy Cave Pet Bed. Sidewall :25 in. Diameter x 4 in. Sidewall:35 in. Diameter x 4 in. Sidewall:45 in. Diameter x 4 in.